Don’t you hate manners? I know I do, especially when I’ve just finished the most delicious soup ever and all I want to do is lick the bowl until I’ve lapped up every lost drop. This was my recent experience at the relatively new (opened in late winter) Revolution Brewery, where we went to celebrate a friend’s birthday. I always love microbreweries, so I was expecting a nice time, but nothing could have prepared me for the delight that was the Cheddar Ale Soup, a rich blend of Wisconsin cheddar, golden ale, thyme and sour cream. Definitely wait an hour to swim after indulging in this creamy masterpiece. 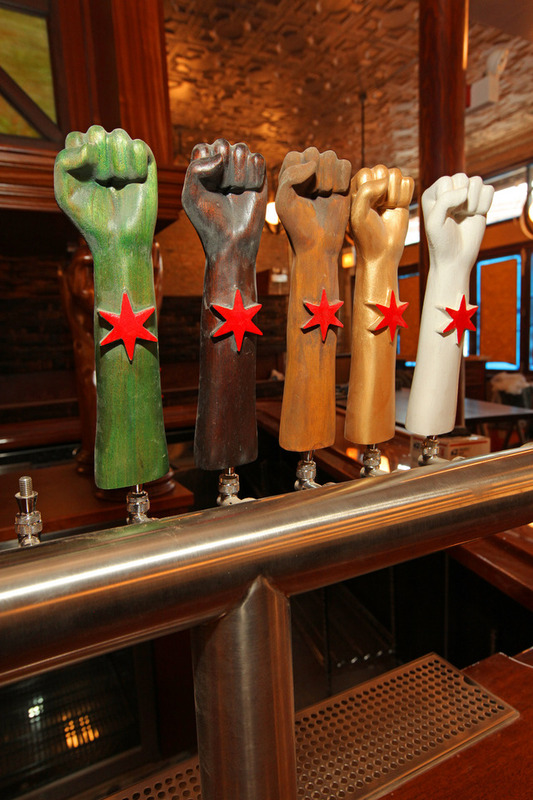 In addition to the communist-themed design (note the beer taps in the photo; they’re part of the raised fist motif), the menu is also revolutionary. Bacon fat popcorn, roasted beet and duck confit bruschettas, beluga lentils with quinoa and root veggies, oh my! I ordered and enjoyed the Caesar salad (snooze alert, I know, but I had to offset the waist-expanding cheddar bliss). I also tried a few bites of a friend’s Tempeh Reuben, which was a treat with its vegan Russian dressing. I’ll go back to order the Smoked and Grilled Tofu sandwich. Lest you think they specialize in vegetarian fare, fear not. Burgers abound, as do pizzas. Oh, they also have beer. I tried the Iron Fist and the Best Coast India Pale Ales, both of which were tasty, but could have been hoppier. So, if you lean left, love microbrews and innovative eats (there’s something for everyone, I promise), head to Logan Square and check out Revolution Brewery. Plan on big crowds, especially on weekends, when, it seems, working men of all countries, unite! You didn’t see Wayne’s World 2, did you? I hope not. Anyway, the main character in that movie, whose name I forget, and his friends hung out in this bar called Comrades. One of the few memories I have of that movie. Because of that, I was a little distracted and had somewhat low expectations of Revolution Brewing, a nice pub in Logan Square. The communist theme is an interesting choice–and it’s making it hard for me to resist turning this whole post into one bad Commie pun. I drank no vodka, ate no beef stroganoff, saw no tea rooms, did not even partake in Cuban food. But I really enjoyed it. What if the UK went red? RevBrew* would be an awesome neighborhood pub if I lived in Logan Square. They have a great pub vibe, a long list of their own beers, and a great menu. *Which is what I’m calling it because that’s a lot easier to type. I had the fish and chips, because, you know, it’s such a Communist dish. But despite the questionable provenance, it was really good. Light, crispy fried skin with lots of malt vinegar. It came like it should, on newspaper in a basket. Don’t worry, they put wax paper between the food and the newspaper. Plus, the beer list is pretty surprising. It’s long, with some uncommon brews. One of my favorite beers lately has been milk stout, and I was excited to see that RevBrew had their own. It’s great, complex and smooth. If keeping places like Revolution Brewing out of the neighborhood was what that whole Cold War thing was about, maybe we picked the wrong side. Anyway, I wouldn’t say it’s a destination spot, but I’d definitely recommend it if you’re in this part of the western bloc. It’s 100 times better than Wayne’s World 2.